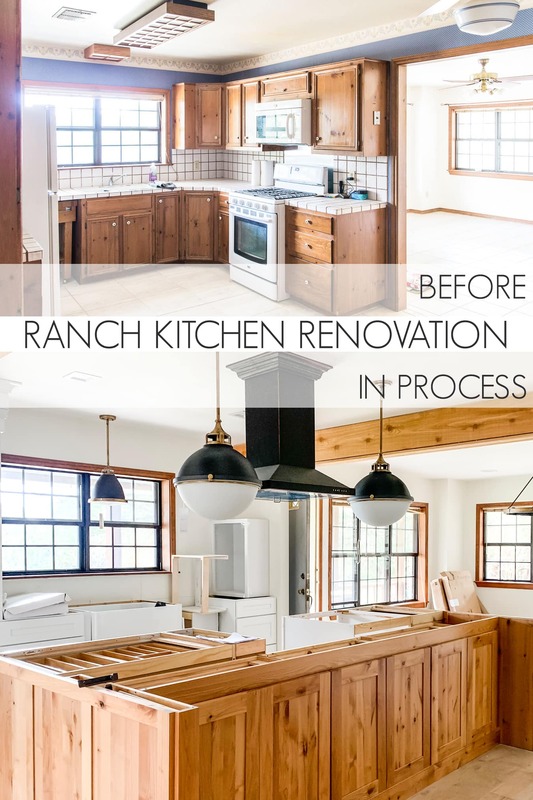 This ranch kitchen renovation takes a small, outdated farmhouse and converts it into a rustic modern kitchen perfect for gathering family and friends. That’s how I feel about our renovation at Little Pax Ranch. This post won’t have the “after” pictures or the full reveal (don’t worry, that’s coming soon! ), but I can’t wait any longer to tell you about the process and progress. Plus, this will help the full reveal to make more sense. First of all, I want to give a little more backstory on this place. I shared this story before, when I revealed the tiny house on our property, but I think it bears a quick summarizing here. 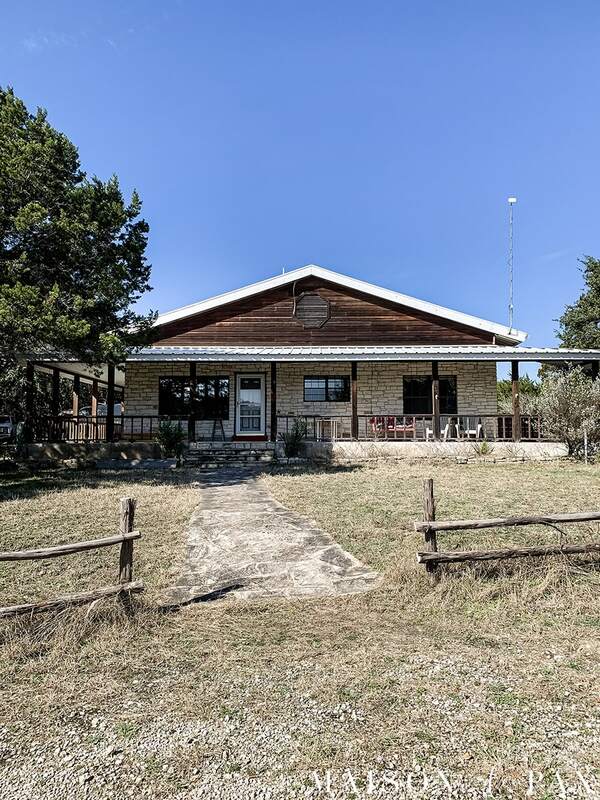 My great grandparents had property in this part of the Texas hill country back in the 1950’s, when my mother was a little girl. Since her father’s job had them moving a lot, the little property here was the most “home” my mother ever had. Fast forward to the early 80’s, when I was a girl, and my grandparents retired to this same area, marking my childhood with endless visits there. Ridiculous antics when all the cousins gathered there (like using the golf cart to help us water ski across the pool and building two-story forts deep in the woods) are the cornerstone of some of my favorite childhood memories. I even got married on their property. But after my grandfather passed away, my grandmother was no longer able to live alone out there, and the property was sold. 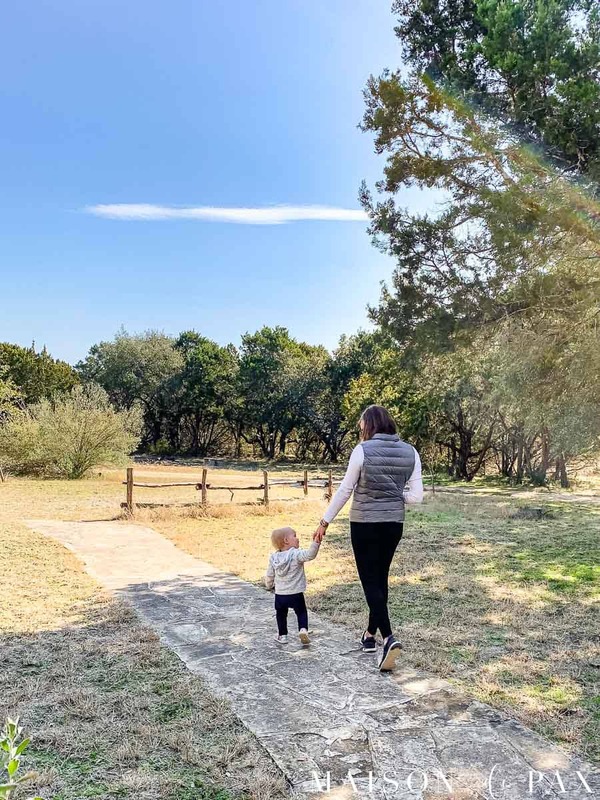 Ever since, we’ve been saving and looking for a way to get back a little slice of that hill country area we love so much. 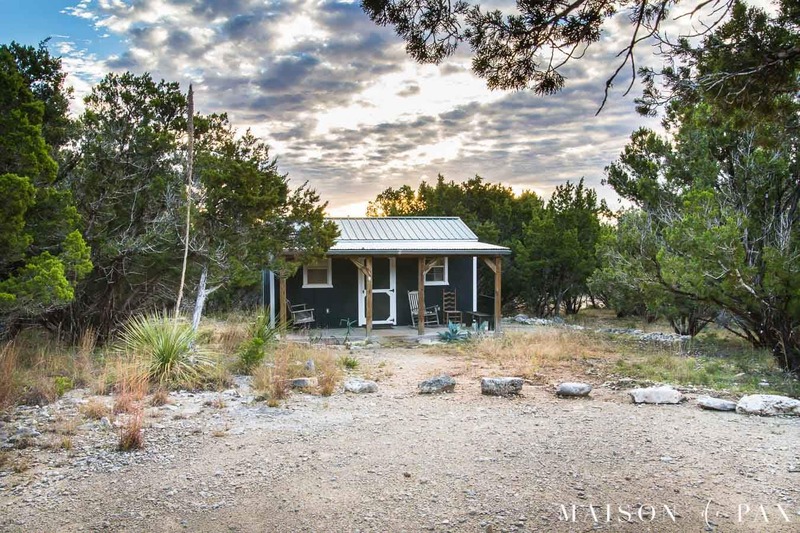 Just over a year ago, we found this property with about six acres (enough to feel secluded and allow the kids to roam, but not so much to keep up from a distance). 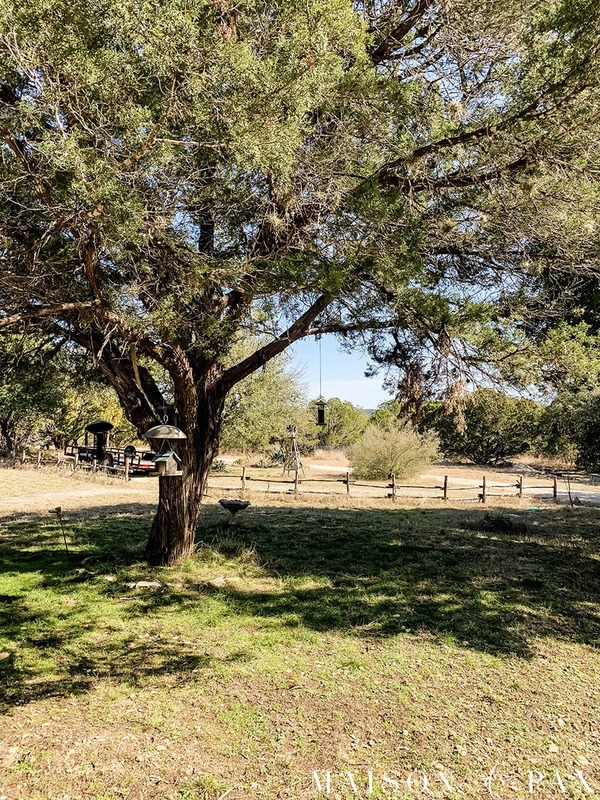 It’s only a few minutes away from the old family property, and we loved the natural beauty of the land, the tiny house, the charming split rail fence, and the potential of the big house and workshop. But it definitely was awaiting a makeover. 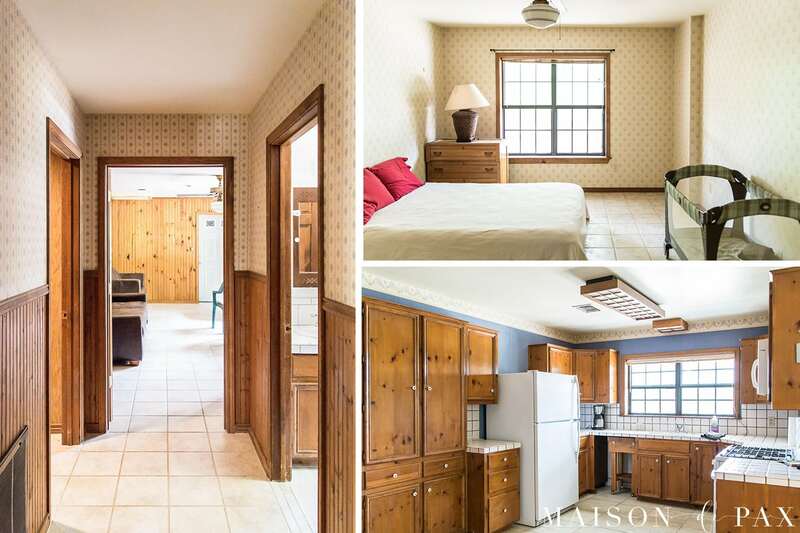 We could have replaced wallpaper and added a lot of paint, and it honestly would have been a sweet little weekend house. But 1600 sf, a 15×15 living room, no dining room, and just three bedrooms wouldn’t really fit my family very well. If just my parents and siblings all show up (with spouses and kids), there are 17 people… and that doesn’t include any of the cousins. And our dream is for this weekend house to be a gathering place for friends and family. Plus, the attic space was too tempting to pass up. 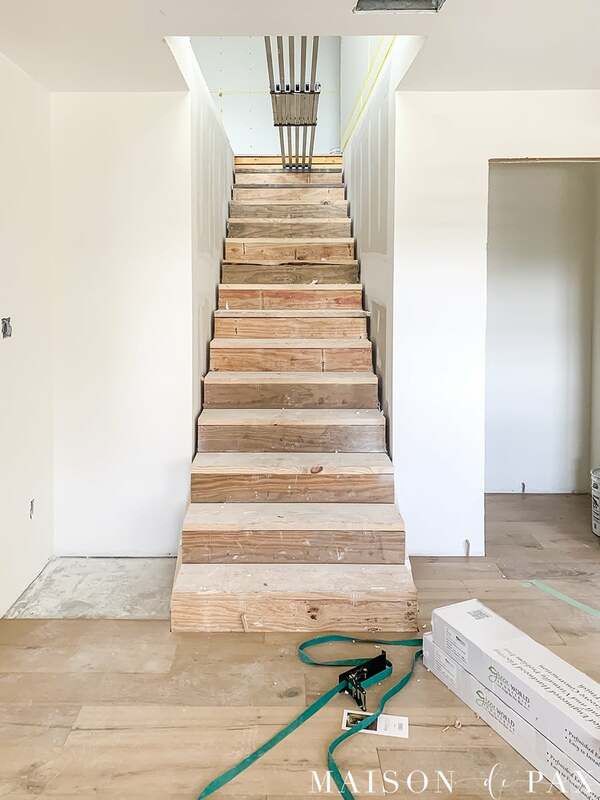 This is almost what it looked like on our first visit (minus the hole we cut for the stairs and the beginning of framing that you see.. not sure why I can’t find an earlier picture! ), and I knew that by closing it in, we could gain almost 1000 sf. 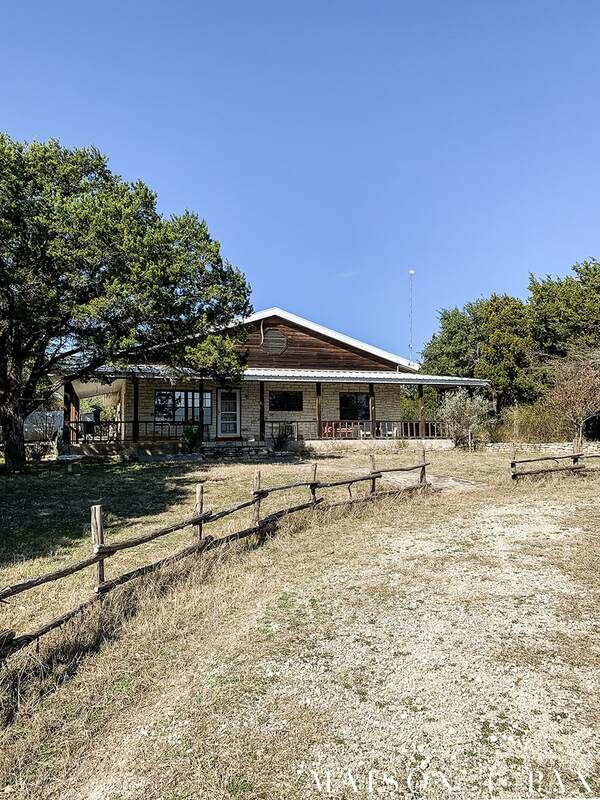 So when we found out we got the property (it was actually under contract when we first saw it, but that fell through! ), we knew a great renovation was about to begin. 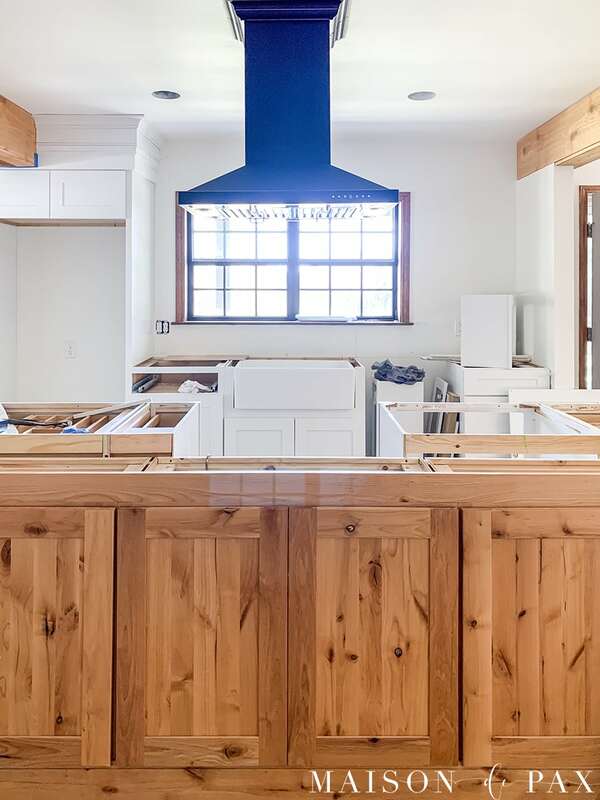 I’ll share more about the full house plans later, but today let’s focus on the kitchen (because that’s the part I’m almost ready to show you!). As you see on the plans above, the front of the house along the porch used to be a small living room, an eat-in kitchen, and a bedroom. Here’s a look at the interior of that space. 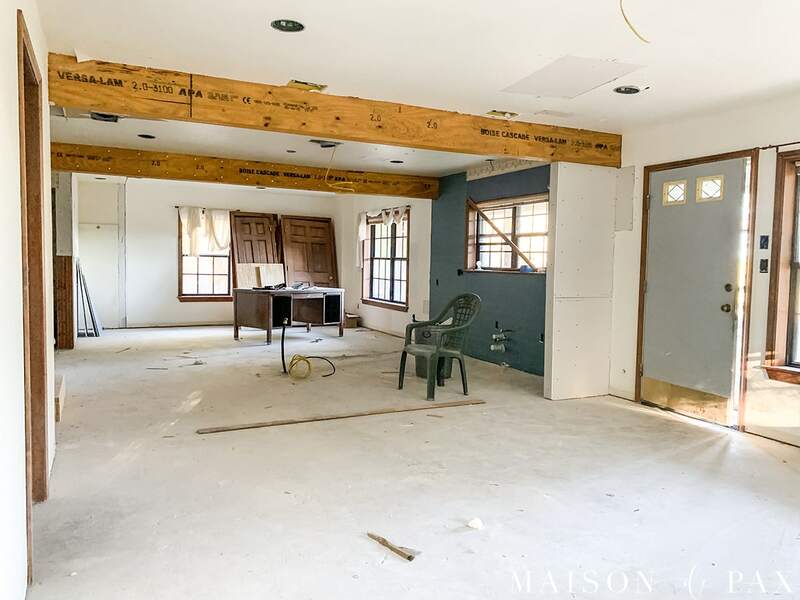 My immediate plan was to give up the bedroom at the front of the house by knocking down the walls on either side of the kitchen and creating one large living/kitchen/dining space. 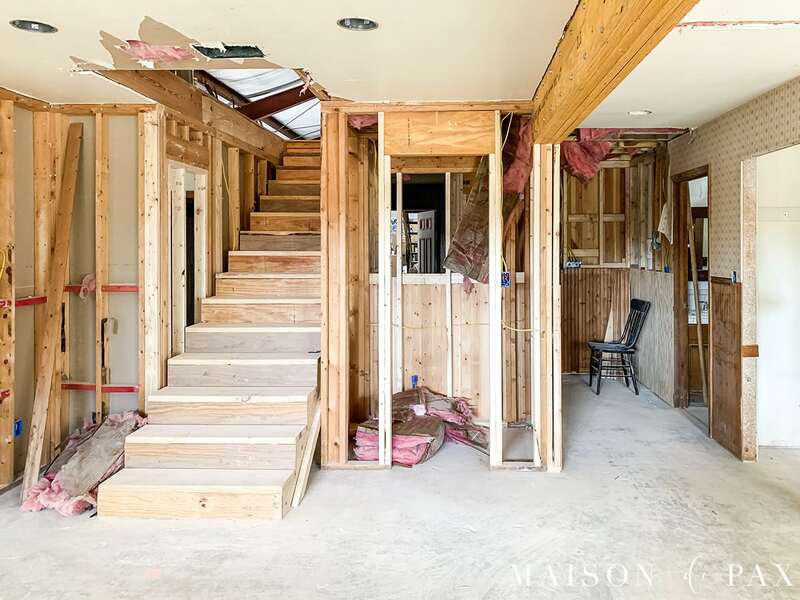 It was easy to imagine the great room, but it took a lot of measuring, planning, drawing, and even knocking down walls before we could determine the exact location for the stairs. 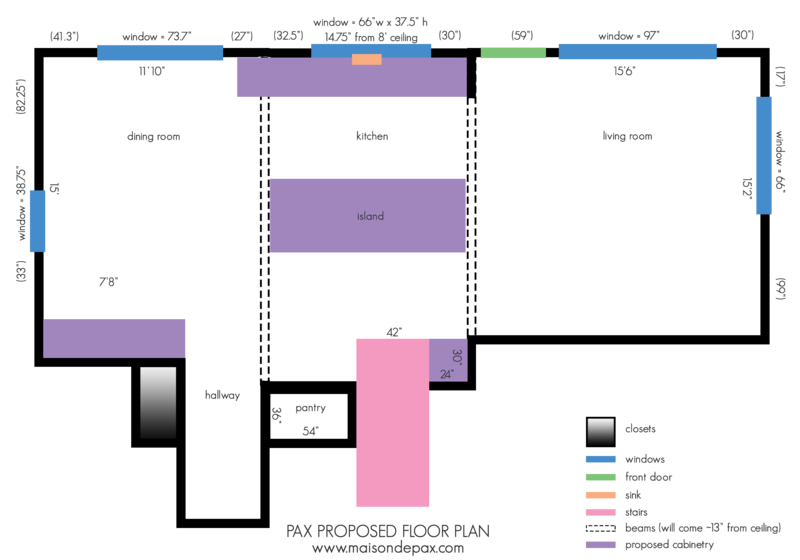 We had to take into account the downstairs floor plan and upstairs floor plan, as well as the AC and electrical routing. The permitting was a huge challenge, too. 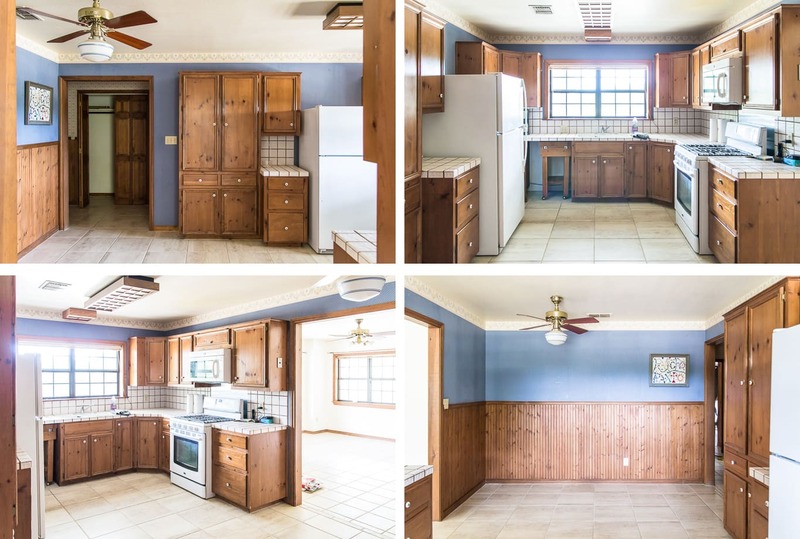 If you are considering a massive renovation like this, just multiply your timing estimate by about 37 and you might be ok. 😉 To be fair, we were talking about some major changes. 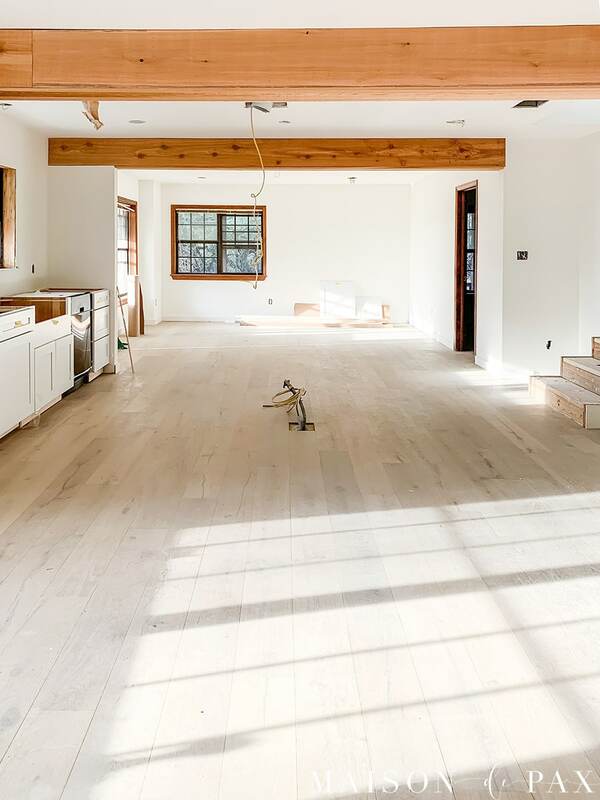 As I mentioned, I knew I wanted to take down the walls on either side of the kitchen to create one large living/kitchen/dining space, with a huge island at the center of it all… And the engineering required large support beams in their place. 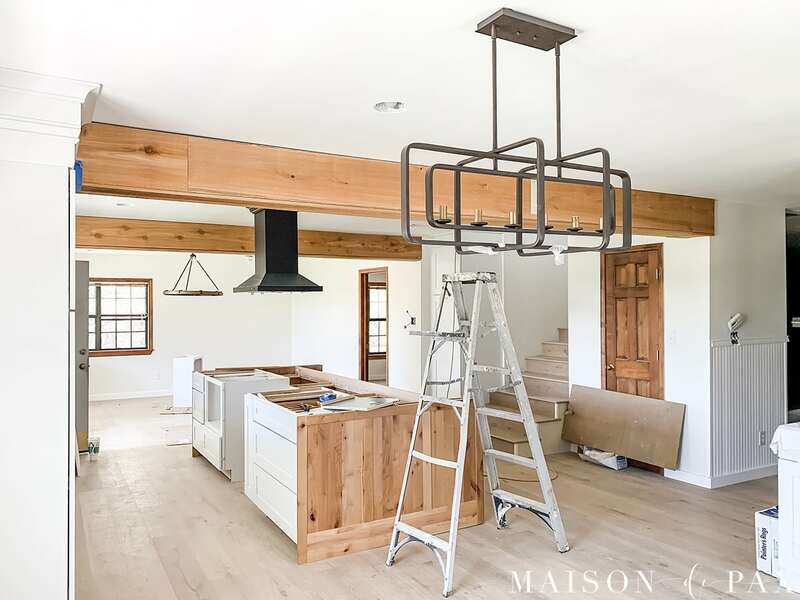 We wrapped the beams in simple cedar and finally decided on the location of the stairs… and I think it’s perfect – just at the back of the main kitchen area. We were even able to fit in a little pantry beside the stairs (where the AC unit was formerly housed) and tucked the laundry/mudroom under the stairs (more to come on that later). 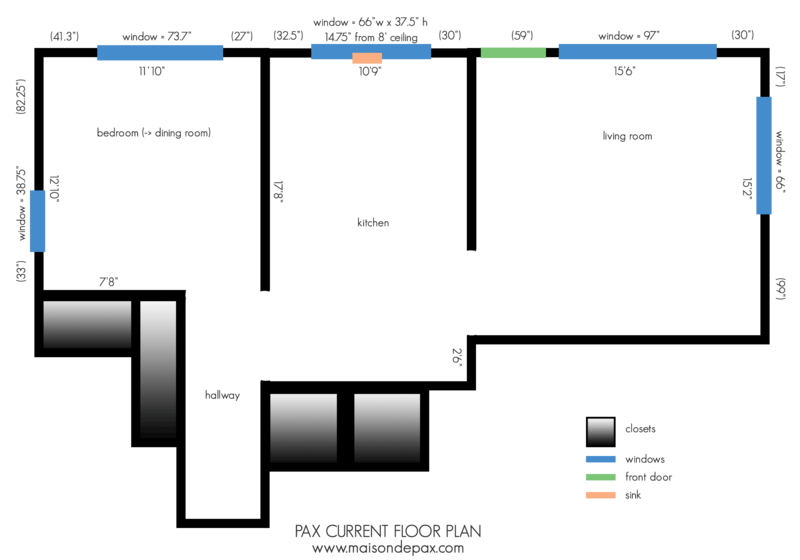 As you can see, we also replaced all the flooring with wide-plank engineered oak floors. It’s actually the same flooring we used in our current home but in the Rivera color. 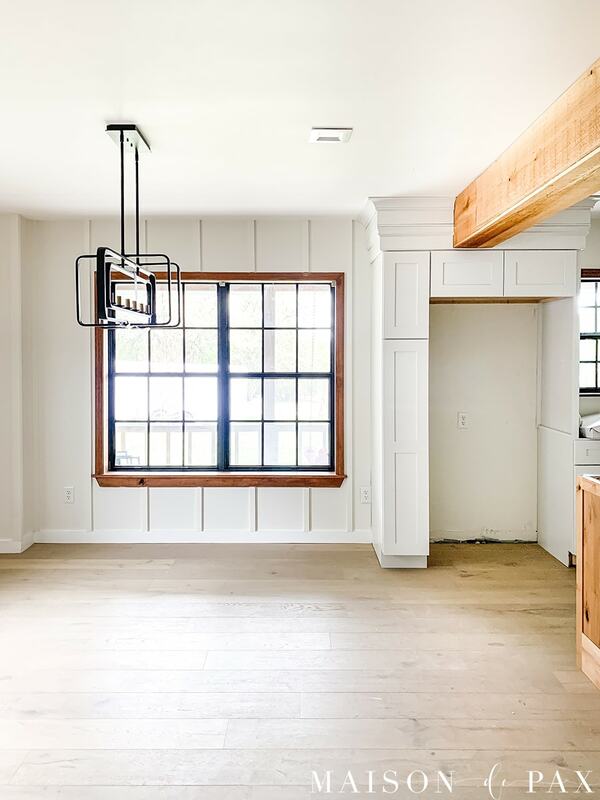 Once the walls and floors (and HVAC and electrical and plumbing… it’s been a loooooonnnnnng process) were done, we were able to begin installing cabinets and seeing the space take on more life. Traffic flow was a huge priority for this space. 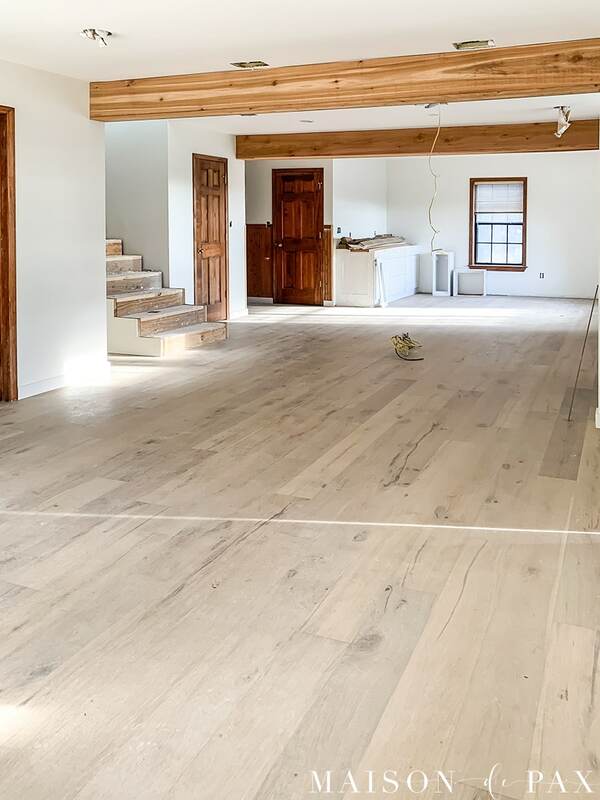 Even though we are expanding into the attic, the main living area of this home is not enormous, especially considering the number of people we hope to gather here. So I knew we needed plenty of walking space (48″ minimum) on either side of the island. To achieve that and still have a 12″ bar overhang for seating, we put 24″ deep cabinets back to back with 18″ deep cabinets. It will make the overall island approximately 4.5′ wide, and I think it’s the perfect size. We wanted to keep the kitchen sink where it was, and since we removed the other kitchen walls, the range had to go in the island. I shared more about this when I shared our appliance choices for the space. That meant an island hood, too, which was a first for me. Working around the large support beams was challenging, but I’m so pleased with how it’s turning out. It’s all coming together beautifully, and as I am writing this, the final countertops are being installed! After that, it’s backsplash and touch ups… I can’t wait to share the full reveal with you soon. Love what you’re doing but I’m confused. 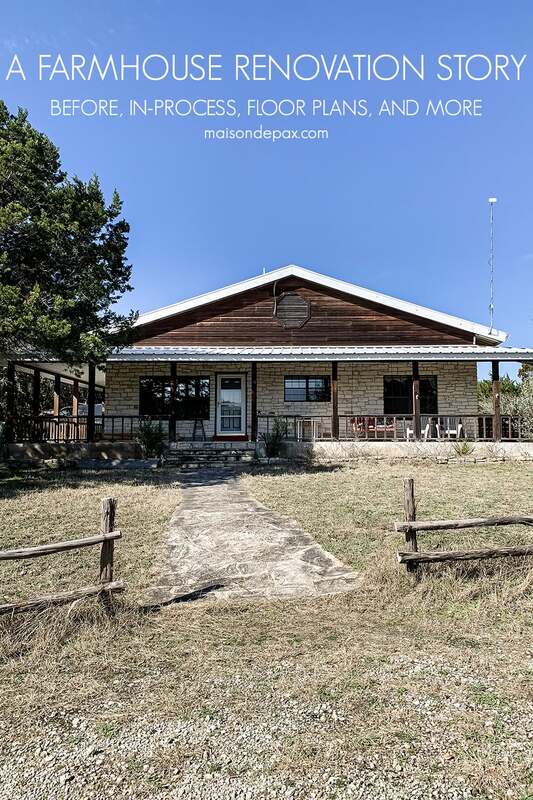 Are there two different houses on the property? 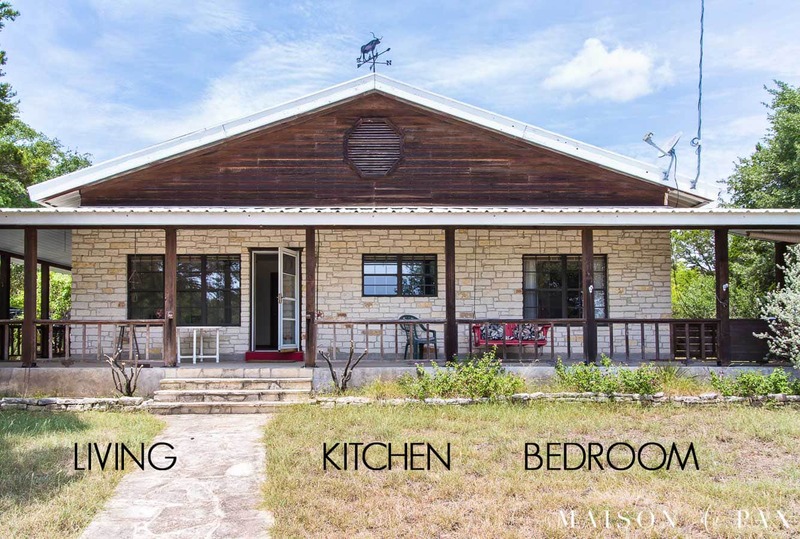 The first exterior picture of a house is totally different from the second one. Which is the one you are renovating? I am so looking forward to following you on this journey Rachel. Thank you! I’m so excited to share it after the last final touches! Thank you! The memories of my grandmother have definitely made this a reality for me! Wow, amazing transformation. Love the new kitchen and that island is perfect for sure. Thank you so much, Marty! Can’t wait to show the whole reveal! What a change and can not beat the property. Very nice and some awesome changes. The lighting is amazing. Never seen the globes. Cannot wait to see it all together. Excited to share with you soon, Stephanie! Your kitchens have always been fabulous wherever you lived and this one will be too. You will have a great place to celebrate family times together and make lots of memories. Thank you for sharing, those children are going to love it. Thank you! I do love being in the kitchen with the whole family! The difference the floor made before anything else. It looks fantastic! I so agree! I’m loving the new floors! What a wonderful space for making memories! Can’t wait to see the final reveal of the kitchen! Thank you! I’m so excited to share! Love the story behind the property! It’s amazing that you’ve decided to preserve the family tradition and also add a modern vibe to the house. 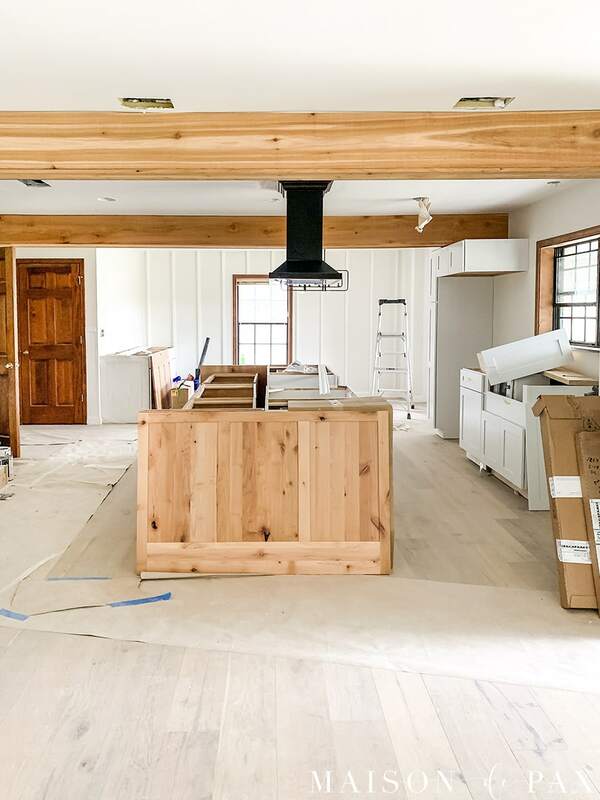 I can’t wait to see the rest of your renovation plans because judging by the kitchen, it’s going to be wonderful. Thank you! I am so excited to share the whole thing! Hi Rachel, really lovely ideas for a kitchen renovation. Your kitchen looks really beautiful. Thank you for the share. Keep up your good and best work.